Available in 2 sizes, 4 and 6. This is my first Isabey brush. 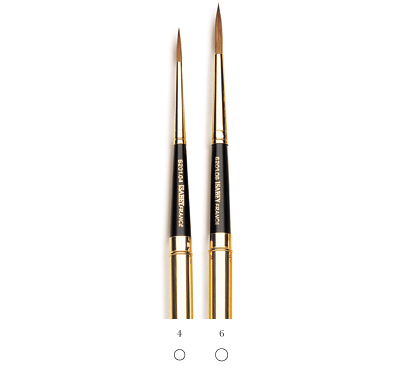 I generally love French-style brushes and have quite a few of wonderful ones by Leonard. This particular brush looks nice and has good pint and snap. The size 6 corresponds to about 4.5 of WN series 7. the handle is very comfortable for a travel brush, but my handle cup is loose and sort of falls off. I had to use pliers to squeeze it a bit so it stays in place. The price is very reasonable - so it's almost 5 stars. The brush is very nice and comfortable with good point. It is relatively small for #6 - more like size 5 in tuft length and #4 in diametre, but very good for detailed work. I already have complete set of Rosemary travel brushes, whose rounds are all bigger than this. I also have Escoda, W&N, da Vinci and Talens Rembrandt (along with Rosemary and CO over 20 brushes), but this one is the most comfortable "small" round I have so far.